as well as control strategies that exceed today’s code requirements. wiSCAPE’s enterprise software suite offers real-time asset management using customizable maps and dashboard-driven pages, to get immediate visual confirmation of safe operation status, energy savings, and peak efficiency. 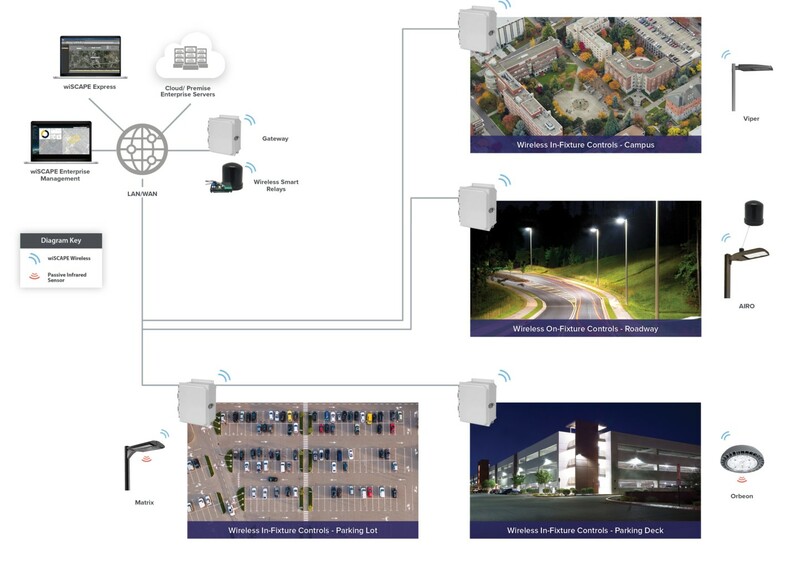 wiSCAPE provides the ability to monitor, manage, and meter a vast number of lighting assets creating an optimized, resilient lighting infrastructure. Data generated by wiSCAPE’s advanced energy management tools, utility-grade metering and 24/7 diagnostic reporting with configurable alert notifications, can be used to improve the bottom line by managing key lighting control strategies. wiSCAPE uses a highly secure wireless network to ensure critical data is locked down. The software can be reliably integrated with 3rd party systems to combine technologies when needed. Managing site lighting operations is easier with the wiSCAPE Express and Enterprise lighting control and management software. Using map, satellite or imported site plans, users can gather crucial operating status and energy usage data. Projects of any size can be configured and managed using the wiSCAPE Express software. Large and multi-site properties will also benefit from the comprehensive reporting and energy dashboard tool in the wiSCAPE Enterprise suite. that information in a customized dashboard. wiSCAPE®-enabled luminaires provide you the breadth and flexibility to address all your project requirements today and in the future.